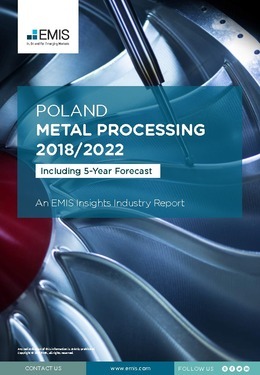 The Polish metal processing sector is the 8th biggest in Europe and the 18th biggest in the world. It constitutes 0.5% of the country’s GDP and its exports account for 9.4% of the country’s total exports. The sector is dominated by the production of pig iron, crude steel and basic steel products, which were responsible for 93% of the total basic metal volume produced in 2016. The sector employs over 60,000 people or around 0.41% of the country’s total employment. The biggest trading partner is Germany with a share of over 25% in both imports and exports of metals. The metal processing sector is dominated by one big player ArcelorMittal Poland, which achieved 28% of the total country’s sales in 2016. This report provides a complete and detailed analysis of the metal processing sector for Poland. EMIS Insights presents in-depth business intelligence in a standard format across countries and regions, providing a balanced mix between analysis and data.